A Cuban-American Donald Trump supporter outside the GOP presidential primary debate last March in Coral Gables. He tweeted Latino voters photos of himself eating a taco bowl on Cinco de Mayo – which is about one racist notch above thinking that Instagramming yourself eating fried chicken will score black votes. He vowed to build a wall on the U.S.-Mexican border and suggested Latinos could not be fair judges in American courts since their families are from Latin America. He threatened the kind of tin-pot stunts – like jailing political foes – that many of those families are fleeing when they come here. RELATED: We've Seen the Trump-Chavez Comparisons. How About Clinton and Rousseff? So Trump was polling as low as 11 percent with Latinos at one point. All Clinton had to do was engage Latinos. Connect. Galvanize. Convince them to vote for her and not just against Trump. If she did, she’d collect an even larger share of Latinos than the 71 percent President Obama got in 2012 – probably 80 percent. It would push her over the top to the White House as America’s first female president. Instead, exit polls like CNN's indicate Clinton secured about 5 percent less of the Latino vote than Obama did – and Trump snared almost 30 percent, above the record low 27 percent Mitt Romney got four years ago. Latinos turned out in force. So how did a whole third of that group, which had been slurred over and over by Trump, end up with him instead of...With Her? Here in Florida, Florida International University’s New Latino Voice exit survey shows Clinton winning just 60 percent of Latinos – no better than Obama 2012 – to 36 percent for Trump. Clinton’s Latino lapse may have cost her Florida’s all-important cache of 29 electoral votes. So how, in Florida and across the country, did a whole third of a group slurred over and over by Trump end up with him instead of…With Her? Staunch Clintonites will say Latinos let Hillary down. Uh-uh. That might be easier to swallow if Latinos had delivered one of those lame turnouts they were notorious for in the past. But this year they marched out in close to record force. Bottom line: if the exit polls are right, Hillary let Latinos down. Take Cuban-American voters first, since they’re still the straw that stirs the state’s Latino latte. When Trump came to Miami two months ago pledging to scrap Obama’s normalization of ties with Cuba, a big question was whether it would do more to A) move older and more conservative Cuban exiles into his camp or B) nudge younger and more moderate Cubans into Clinton’s. Answer: A. According to exit polls, Trump won a majority of Florida’s Cuban-Americans – even though that same majority, according to a recent FIU survey, support Obama’s Cuba project and his presidency. Granted, other issues may also have been factors. But Clinton failed to captivate more Democrat-leaning Cubans here – at least partly because she failed to convince them she was as committed to Cuba normalization as they were. 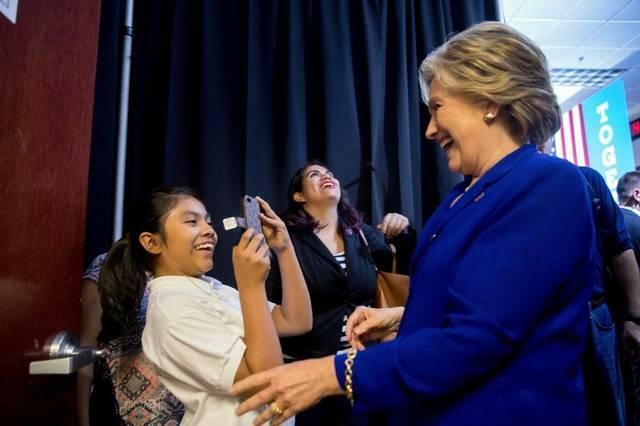 11-year-old Latina Karla Ortiz takes a picture of Hillary Clinton at a rally in Las Vegas this year. Then take Puerto Ricans, the new Latino force in Florida whose voter boom was supposed to be Clinton’s decisive boon. She never really capitalized on their urge to be taken as seriously as candidates court Cuban-Americans. She never really spoke to the issue of Puerto Rico’s collapse – and Washington’s controversial handling of it – in ways that gel a political bond. Which is why, when I talked to Puerto Ricans in enclaves like Pembroke Pines on Tuesday, I sensed more anti-Donald energy than pro-Hillary excitement. Other Latino groups also ended up feeling taken for granted by Clinton and the Democrats – which has become the party’s disastrous m.o. with minorities. Latinos are certainly not monolithic; economic concerns mattered too. Still, few cohorts had as many reasons to back her, and reject Trump, as Latinos did. That speaks to Clinton’s larger flaw as a candidate. She’s a tough, brilliant public servant who could have been a great president. She can also be an elitist, self-righteous technocrat who considers herself above being a great, flesh-pressing politician. And so she let her campaign’s so-called Latino firewall add fire to Trump.